Meet your friendly tour conductor at a central Tokyo meeting point, then relax on a scenic 2.5-hour transfer to Hakone. After arriving in Hakone, board a pirate ship cruise for a thrilling 30-minute sail, enjoying the spectacular views of Mt. Fuji. After stopping at Tokendai Harbour, head to Togendai Station, where you will take the Hakone Ropeway for approximately 16 minutes to Owakudani Station. From the station, walk to Owakudani Valley, where you will have around 45 minutes to take in the breathtaking sights. Then, head to "Akakara Gotemba", a local restaurant, where you will enjoy a buffet lunch for about 70 minutes including around 70 dishes such as beef, pork and chicken yakiniku, deep-fried chicken, kushikatsu skewered meat cutlet with miso, dessert, etc. 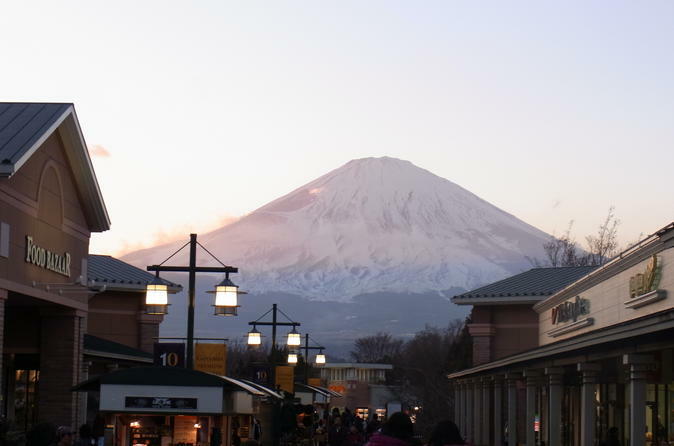 After lunch, make a pitstop at the Gotemba premium outlets for about two hours to shop for souvenirs. From there, you will head back to Tokyo, where your tour concludes. The approximate arrival time to Shinjuku is 18:00-18:30.